Well it looks like almost everyone in the area has used Caithness General at some time. CHAT will discuss at its meeting in the Park Hotel, Thurso whether to sponsor a candidates for the Westminster election on 8th June. CHAT - Caithness Health Action Team Bignold Park, Wick 2.30pm Sunday 23rd April 2017 Morning everyone, sorry for the delay. We have broken the categories down into ten groups for Sunday's Visual Impact Protest in the Bignold Park, Wick at 2.30pm. Another packed show this year with hundreds of new models not seen before at previous exhibitions. Check out many photos by clicking the Photo Gallery link above..
Caithness Model Club handed over a cheque for £500 to Caithness Health Action Team (CHAT) at the first day of their annual model exhibition in the Norseman Hotel, Wick today. Chairman of CHAT Bill Fernie and committee member Liz More accepted the donation on behalf of CHAT. 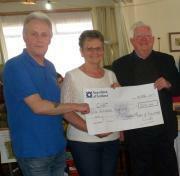 Caithness Model club today handed over another cheque for £500 to Caithness Befrienders. The group who are involved in matching volunteers with people who might live alone have been increasing their activities. Posted on The CHAT Facebook page for our next action. Evening firstly thanks to everyone who has supported us and offered help. Chairman of Caithness Health Action Team (CHAT), Bill Fernie received a big boost to the CHAT funds from Wick Community council when they handed over a cheque for £1000 to help with campaigning about Health related issues in Caithness. Bill said,"The funds coming in show that we have a huge amount of support for our campaigns with the community making sure we can do things to highlight concerns at reductions across our services for health and the discomfort caused to mothers and families who need to travel to Raigmore. The Caithness Science Festival had its annual showcase for many areas of science both in Caithness and from elsewhere with lots of experts to answer questions from people of all ages. Lots of photos in the gallery..
CHAT's treasurer has sent out a message about today's Funday with regard to the stalls funds - "Well done to everyone involved in the fundraising stall in the Market Square today, the total raised was £672.87 which is really great. The total is for everything - raffle, donations, etc it includes the £40 that Bill received as donations." CHAT chairman Bill Fernie paid tribute to a great and dedicated group who are pulling out all the stops in their efforts to oppose NHS Highland plans to downgrade maternity services at Caithness General and he said, Once again people in Caithness have shown their generosity and that they are prepared to help ensure that funds are not a problem in taking the campaign forward. Much stress on safety issues and much of what is in the NHS report backs this claim up. But is that the whole story? There are other issues that are impacted by a decision to remove the consultants. The maternity downgrading issue will be discussed at a public meeting tonight in Assembly Rooms, Wick. The meeting starts at 7.00pm. Caithness Health Area Team - CHAT members and supporters will demonstrate outside Wick Town Hall when the Caithness Committee meets on Tuesday 22nd November 2016. Meeting is open to the public but may be restricted once seats are full. The long-awaited report of Public Health Scotland (PHS) into maternity services at Caithness General Hospital was launched today, and recommends that the Henderson Maternity Unit moves to a midwife led model (CMU). The Report concludes that Caithness does not have the population to support an obstetrician, and that the presence of specialists without the backup of intensive care facilities or a paediatrician creates unnecessary risk factors for patients. An interesting evening sure to be a hit with the kids.. The Rangers are planning a series of exciting events such as guided walks and children's activities throughout the Highlands. "There is something here for everyone" says Eilidh-Ann Phillips, Senior Ranger for South Highlands. Sunday 2 October 2016 Walk for Highland Archaeology Festival Seeking hut circles using Li. Dar images - Geoff Leet to lead. Friday night on 2nd September 2016 gives you the chance to go out with an experienced ranger to find out about the bats that are all around us in Caithness..